Having located the mound(s) and having done a quick survey I was content that I would have something to show Dr SP Gupta when he came down a few days later. Dr Gupta did not come alone but brought along Prof VN Misra (Ex Director, Deccan College), Shri RC Agarwal (Director ASI), Shri KN Dixit (Ex Director ASI) and proceeded with Dr Dhalla, Mr Porus Master (Architect) and me to visit the caves at Bahrot and then the site at Sanjan. The Bahrot Caves are essentially a line of seven (extant) water cisterns carved onto the cliff face of the Bahrot Hill a large basalt outlier of the Western Ghats. The hill lies in a Scheduled forest and the acess to it is via a moderately steep 4km long trek. To reach the caves one need to go to the town of Gholvad, roughly 140 km north of Mumbai. From Gholvad town (which is on the beach) you need to take a turn inland towards Aswali village which lies near a small dam of the same name. From this village at the foot of the hills its a good 2 to 3 hour climb to the top/caves. The caves are situated on top of a very steep cliff on the eastern edge of Bahrot hill, there is a small plateau on the top and in the past it was fortified by the construction of a three sided wall with the cliff needing no protection. There are remains of a small bastion on its northern end and it is from here that the trail enters the plateau and goes on to the caves. There are also the remnants and stone outlines of other structures within the fort. The Bahrot Peak was referred to by the British as St John's peak. The cisterns are mainly simple rectangular shaped tanks with the exceptions of two which have been quarried into the overhang and have been supported by pillars carved out of the living rock. Sadly only one of these holds water today and that too only till end January - early February. The largest of the cisterns remains dry for almost the entire year and it was this one with two pillars that the Parsis claim was the 'cave' in which their most sacred icon the Iranshah fire was hidden after the fall of Sanjan. 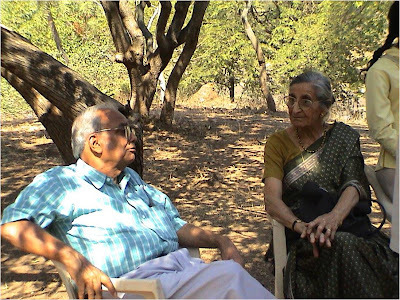 The top of the hill was covered in scrub and the structures and fortification became clear only after Shri Pankaj Joshi (Architect) and his team cleared the top and conducted a complete survey some months later. THE IRANSHAH - The Iranshah is the sacred Parsi Zoroastrian flame that burns inside the Fire Temple (Atash Behram) of the same name at Udvada (Dist Valsad, Gujarat). This flame according to the oral traditions of the Parsis was first lit on their successful landing on mainland India at Sanjan and has been kept burning ever since by the Sanjan priests. After the fall of Sanjan this fire was moved into hiding in the Bahrot caves for 12 years and then into the forests of Bansada from which it eventually was rescued and taken to Navsari. It was taken to Surat for a few years when it was at Navsari as the Mughal campaigns threatened its existence ..... finally in 1741-2 it arrived at its present location in Udvada. The Iranshah is perhaps the most powerful religious icon of the Parsi Zoroastrian community and is considered of primary importance to the well being of the faith. All newly initiated Zoroastrians and newly wed Zoroastrian make an almost mandatory pilgrimage here. It is also otherwise an active pilgrimage locus for the community and droves of Parsis are seen there on all auspicious days. Some Parsis in Mumbai and Surat even make monthly pilgrimages and there are a few new colonies for retired Parsis who would like to live near the Iranshah. Udvada in turn is famous for its Parsi Guesthouses and their food and also for its bakeries making Wine biscuits, Nankhatai and Batasa .... in recent years the Potato garlic papads of Udvada have also become quite popular. The most popular Hotels/Geusthouses/Eateries are the Globe and Ashishvangh. After making the ascent to the caves we were greeted by a truly panoramic view .... to our west we could see the sea, too our east the plains and the old trade route which is todays highway (NH 8) and to our north we could see the modern town of Sanjan. A little to the farthest north I was sure I could see the ancient site. After this trip to Bahrot (more on the 'caves' another day) we then proceeded (I think it was the next day) to visit the site at Sanjan. We stopped at the vad tree and proceeded uphill into the machchhivaad we found the site covered in debris and dried leaves, we then proceeded to the Well and the Mazaar (tomb/shrine) of Shamsuddin Baba. The local Muslim communities believe that the Baba was present here upon the site to welcome the Parsis others believe that he died at the Battle of Sanjan. The well is supposed to be his 'gift' and has never been known to run dry, its is roughly 6 metres in diameter and built of well fired burnt bricks, a leaded weight sent down by us recorded a depth of almost 20 metres from the top. Adjacent to this well was a privately owned field and the owner had just plowed the top metre or so of soil to plant a rose garden. We asked and received permission to go through the freshly upturned soil. We quickly started collecting a wide variety of potsherds and a few fragments of weathered glass. Amongst the pottery were the usual unslipped red and grey wares along with a large number of buff cored sherds of glazed ware, many of these were a deep turquoise green in colour. There were also a few porcelain sherds. Shri KN Dixit promptly informed us that these were most probably of Mughal origin. We were elated by this as the upper horizons of the site could well have been Moghul. We asked the gentleman who owned the plot if he would refrain from digging up the other half of his plot and allow us to excavate here ..... he said sure thing any digging you do will be good for my roses! We went back to Mumbai and I handed over the surface collection to Dr Abhijit Dandekar in Pune. Abhijit was to be our Ceramic Expert and had agreed to take on the job of running the onsite pottery yard during excavations and to study the ceramics in the post excavation phase. He surprised me a few days later by telling me that they were no parallels to our blue-green glazed sherds in any collection of Islamic ceramics of the Moghul period. I was as perplexed by this as him when one of those chances that archaeology is full off occurred. A visiting archaeologist presented a paper with identical sherds! 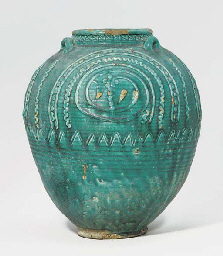 The ceramic was called Sassanian Islamiic Turquoise Glazed Ware or just Turquoise Glazed Ware and it was made in Persia between the 7th and 10th centuries AD. We were finally in business. 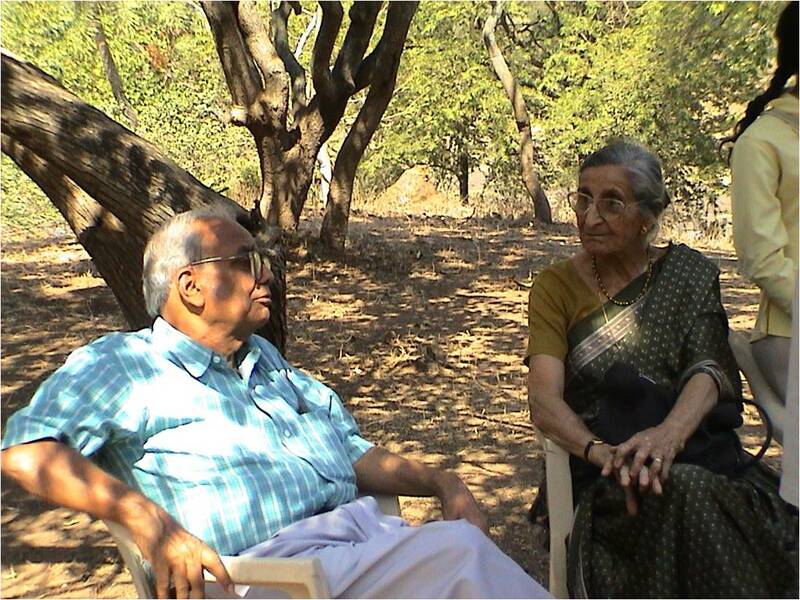 The Late Dr Swaraj Prakash Gupta, IAS, New Delhi - Director Sanjan Excavations and the Late Prof. Mani Kamerkar, Historian. 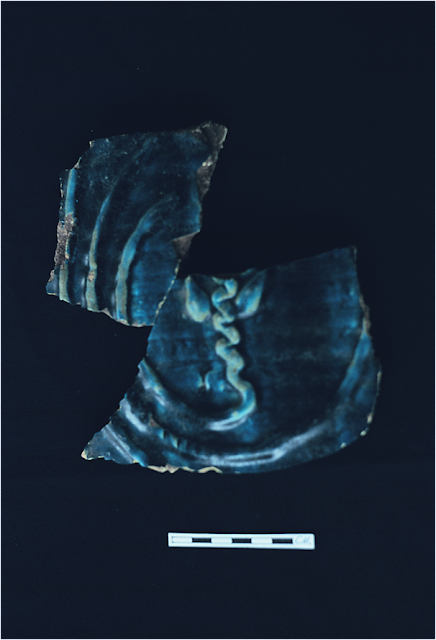 Sassanian Islamic Turqouise Glazed ware sherds from the pre-excavation explorations (that refit) with applique motif identical to similar vessel excavated at Susa from late Sassanian levels. TGW Jar from the Excavations at Susa, Iran - Note the identical design of the spiral motif ending in a sort of flower-like design.